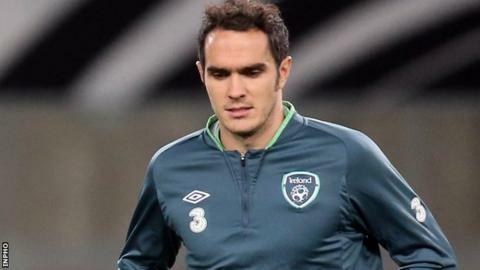 Republic of Ireland defender Joey O'Brien will miss four upcoming friendlies in order to "manage his off season medical programme". The West Ham full-back withdrew from the Irish squad on Monday, his absence reducing the panel to 31 players. O'Brien dislocated a shoulder in January, although he was in the Hammers team which lost 2-0 to Premier League champions Manchester City on Sunday. The Irish will play Turkey, Italy, Costa Rica and Portugal. O'Brien suffered a dislocated shoulder after landing awkwardly following a challenge with Chelsea's Gary Cahill at Stamford Bridge. The 28-year-old former Bolton full-back's career has been hindered by knee injuries. Martin O'Neill's side open their series of friendlies against Turkey at the Aviva Stadium on 25 May before taking on the Italians six days later at Craven Cottage. Two games in the United States start with a Philadelphia encounter on 6 June against Costa Rica followed four days later by a meeting with Portugal in New Jersey.